Cub Scouts always enjoy a fun camp out! As den leaders, this is a wonderful opportunity to complete some rank adventure requirements. 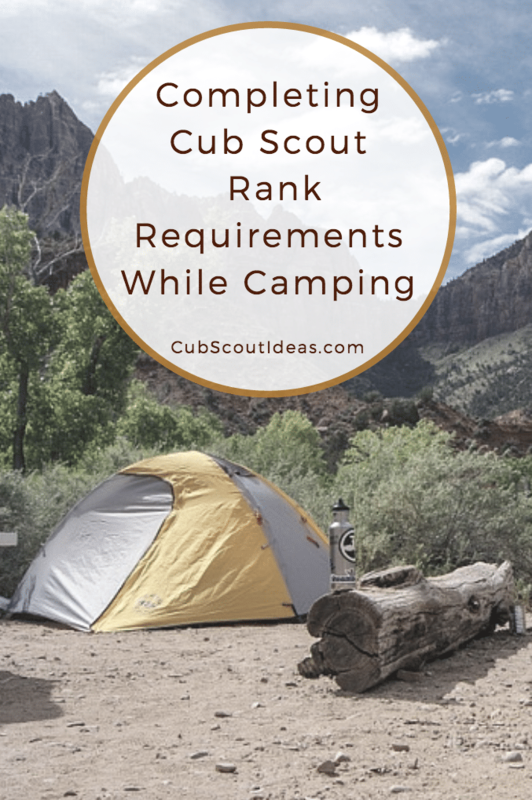 But if we haven’t reviewed all of the requirements looking for activities that can be done on Cub Scout camp outs, we may miss out on the opportunity. That’s why I compiled lists of activities by rank that can be done without equipment during a camp out that will satisfy adventure requirements. So that it’s easier for you to use, I’m making the lists available in a pdf format. There is a master list of all ranks as well as one for each individual rank. But these activities can be done anywhere! We give them to den leader (or den shepherds) at Cub Scout day camp. They’re perfect for the Scouts to do whenever they have a few minutes. Here are some examples of the activities that are in these lists. Wolves can “tell what the buddy system is and why we always use it in Cub Scouting. Describe what you should do if you get separated from your group while hiking” for requirement 2 of Paws on the Path. When they “share at least two jokes with members of your den to make them laugh,” Bears can mark off requirement 5 of the elective adventure, Roaring Laughter. Webelos and Arrows of Light can easily do requirement 2 of the Build My Own Hero adventure by describing how citizens can be heroes in their communities. We all know that busy kids are less likely to get into trouble! 🙂 I love having quick and simple activities ready to implement at a moment’s notice. Click on each link to download the document that you need. Let me know if reference materials such as these are helpful to you. P.S. If you like these handouts, sign up below for more great ideas! This will be awesome to have all the outdoor activities for each den listed together! Thanks! Glad it’s going to help you! Thanks for reading. Thank you so much for this! My son is going on a camping trip with his Cub Pack this weekend! I just posted it for the families to read so that they can help their boys earn their requirements. Perfect timing! Thanks for sharing it with the families in your pack. I am very thankful that you had this post so nicely divided for our convenience. It couldn’t have come at a better time. We are heading out to our first campout next week and now we know how to check a few items off our list. Thanks! Wonderful! Glad it was timely. Thanks for this! I am a first time Cub Master and we are planning a camping trip for early November and our other Cub Master is unable to go so I am on my own as far as planning for things to do. I printed out two full copies for myself and the other Cub Master and printed out the individual pages for each of our den leaders. This is going to make this camping trip so much easier on me! So glad it’s helpful, Summer! Have fun on your camping trip! So sorry! I just added you manually. Thanks! Thanks! this is super helpful!!! Great! Glad it was helpful. Thanks for reading! Are these updated for the new 2015 requirements? Yes, they are! Thanks for reading! Thank you for taking the time to create something like this!!! !